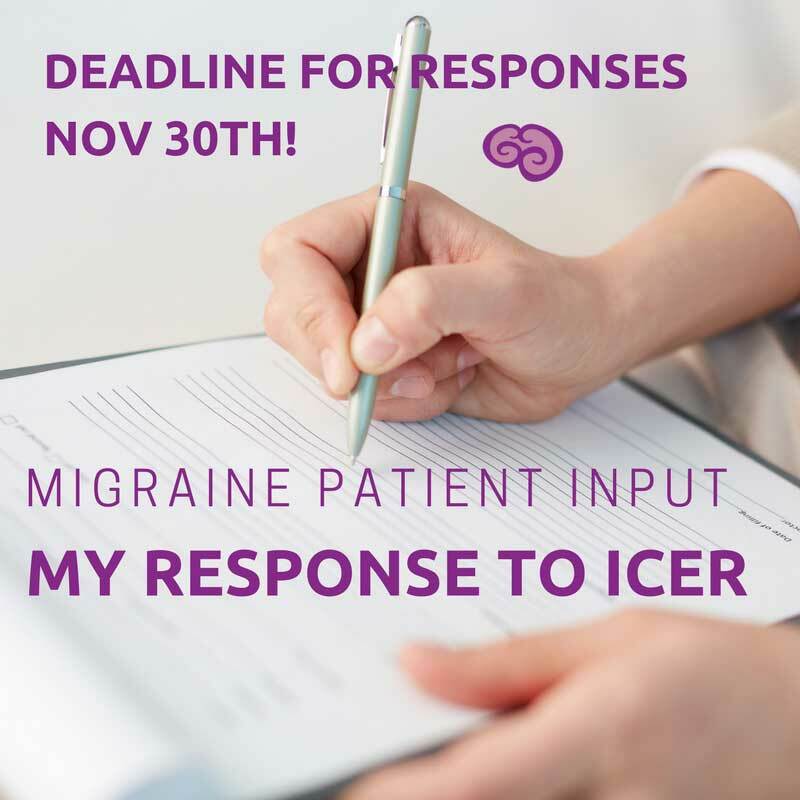 I wanted to share my response to the ICER patient input questions. I definitely went into a lot of detail. Please do not feel you need write a book. The questions that are the most important to focus on are #1, #2, #4, #5, & #7. It’s ok to leave questions blank. This is our chance to be heard! But the deadline is this Thurs, Nov 30th at 5pm EST! If you want to share your responses, let me know and I’d be happy to post them there! Briefly describe your disease experience, including your diagnosis, treatments you’ve used, etc. Be as specific as you feel comfortable with. I had my first migraine attack at age five and they continued into adulthood. The frequency differed each year from none to as many as 25. Right before I turned 30 years old, these attacks became an everyday occurrence. No trauma had occurred to propel the attacks to become continuous. This was not in my plan. I was the youngest vice president at the community bank I had been with since I was 23. I had just finished a semester of grad school at Georgetown. I had an active social life. All of that was turned upside down when I had a migraine attack that has never stopped. Eventually my doctor told me to stop working, something I acquiesced to only after I worked intermittently over two years. My unreliability wasn’t fair to my co-workers, my clients, or to my health. For the past seven years I have not had a reprieve from the pain associated with chronic migraine. The head pain can be excruciating, but that is not the only symptom I experience. *The symptoms that are starred, are the most debilitating to me on a daily basis. It takes a significant amount of medication just to keep the effects of migraine to a bearable level. The following list is comprised of all the medications and therapies I currently use. On a daily basis, I take 15 total pills and have seven other treatments I use when the attacks are at their worst. I do NOT want to be on all of these medications in order to survive my day. The negative side effects of many medications have been difficult to manage at times. At one point, I have stopped all medications only to find that they were absolutely necessary in managing my illness. I routinely practice yoga, stretching and meditation. I have attended 24-weeks of pain management classes. I have used biofeedback, guided meditation, medicinal marijuana, physical therapy. I have looked into nerve decompression surgery, nerve ablation and implanted neurostimulators, but have chosen against them due to personal reasons. This is not a way to live. I deserve better treatment options and to be able to afford them. How do the disease/condition and the available treatments affect your day-to-day life? With chronic migraine disease, I am never able to fully escape the pain as it is an everyday occurrence. The quality of any given day depends on how intense the pain is and for how long. I have functioning, semi-functioning or debilitating days. On average, I spend 80% of my time in my apartment. The other 20% has to be carefully planned out. Will there be any noise, lighting, food or other triggers that will make the migraine attacks worse? I have to take medication before I leave and have all medications with me for any possible scenario when I leave the house. I need an exit strategy. Will I be able to lie down if the pain is suddenly unbearable? Do I have a way home if I feel I can’t drive? Will my impaired cognitive function cause me to become disoriented, forgetful, or lost? Leaving the house, driving and exercise are not always an option. It is rare that any of my symptoms improve throughout the day, they typically get worse even when using rescue medication. Some of the medications I take cause side effects that make me sleepy. During long stretches of time with high levels of pain, my sleep cycle is interrupted, my food intake is altered, showering is a chore and my body feels like it has been beaten up. I rarely cook because it is exhausting and drains me of any energy I may have. Laundry and basic house cleaning are often left to my long-time boyfriend. I always have a plan B if I leave the house. I always carry a notebook with me because I can easily forget my tasks or what people tell me. I build in extra time because any task now takes me twice as long to complete. I have a small radius (about 5 miles) around my house where I am comfortable going by myself. Anywhere outside of my comfort zone, I prefer to have someone with me no matter what my pain level is that day. I can be in this state for days, weeks or even months at a time. I rarely see friends or spend time outside when I am in an especially bad migraine cycle. It can take weeks to build my strength back up. I would rather have a broken arm or a root canal with no anesthesia than have these long periods of pain and total disability. What impact does the disease have on family or caregivers? My parents didn’t imagine that I would still need help at this point in our lives. My partner didn’t sign up for this when we met. My chronic migraine disease has altered their lives as well. I have called on my parents to take me to the emergency room. I have had friends pick up meds or go grocery shopping for me. My boyfriend has adjusted to living with a permanently dark bedroom so that I can minimize my sensitivity to light. When I am hospitalized for ketamine treatments, my mom and boyfriend take turns staying each day with me in the hospital. The treatments I receive make it difficult for me to remember or be able to communicate my needs to doctors and nurses. They use vacation days in order to help take care of me. My family and friends are very understanding of my disease. They go out of their way to make accommodations for me, such as forcing me to lay down when they can tell I am reaching increased pain levels. They invite me to activities or events, knowing that my attendance depends on how bad the migraine is that day. They will come to me to make a visit easier. I’m lucky to have such an amazing and understanding support system, many others like me don’t have this support. What else should ICER know about living with the disease or condition (e.g. impact on your ability to work, exercise, care for family, etc.)? Due to the financial burden of treating migraine and my significantly reduced income, I lived with roommates for many years to have enough money to afford the care I needed. My boss was gracious enough to let me work on a flexible schedule that would accommodate frequent doctor’s visits and days I was completely incapacitated. I used vacation, sick and personal days to cover the hours I didn’t work or make up. I used FMLA intermittently for two years. In 2013, my doctor insisted that I stop working. With hope that my health would turn for the better during 90 days of short-term disability, I didn’t even clean out my office. At the end of the three-month period, my condition was actually worse. I was forced to apply for Social Security disability benefits, which I was awarded. I didn’t even know that migraine attacks could be an everyday occurrence, but I am definitely not alone. Nobody at my age WANTS to be disabled. For two years, I was either in bed or behind a desk. I could barely walk a few blocks without getting winded. I slowly started to exercise, which caused many migraine attacks. It took over a year to figure out what I could do and what I should stay away from. I’ve found yoga to be the perfect exercise for me. However, I am not able to exercise consistently. When I am forced to spend days on end in bed, often I have to start again in building up my strength and stamina. Having chronic migraine has impacted my decision to not have children. While I love children, I am amazed at the women with migraine who have families. They are stronger than I will ever understand. I would not be able to be the parent I would want to be if my daily pain remains unchanged. The fact that migraine disease is hereditary is also a factor. I wouldn’t want my child to go through what I have due to migraine disease. What outcomes are most important to patients? For example, is the top priority quality of life, longer survival, or relief of a specific symptom? For me, quality of life is the most important to me. There is no cure for migraine, however if there was a medicine or treatment that could reduce the severity and/or the frequency of my migraine attacks, that would be life-changing for me. I lost a huge piece of myself when I began having chronic migraine (15 or more migraine days a month). I was forced to stop working at age 32, thereby significantly reducing income earnings. I had to drop out of graduate school. I can no longer participate in hobbies such as singing and community theatre. I can’t even volunteer because I’m not reliable. I never know how I’m going to feel tomorrow. I feel guilty about canceling plans or missing big events. I live in constant fear of the next big attack. The longer the condition persists, the more friends I lose, the more secluded I become. My quality of life deserves to be valued highly. Are there new/emerging treatments that the patient community is anticipating? What are the benefits or disadvantages of the new treatments (e.g. more or fewer side effects, convenience, effectiveness, etc.)? Do you think the benefits will outweigh side effects or risks? I first heard the term CGRP in 2014 during a conference. It sounded promising, but access to it seemed a lifetime away. With each positive step through phase I, II and III testings, the buzz in the migraine community has only gotten louder. The fact that erenumab, and other CGRP drugs in development, will be the FIRST class of drugs developed specifically for the PREVENTION of migraine attacks is exciting – and it is sad that this hasn’t happened before now. From reading trial conclusions, the side effects seem to be lower than many of the horrible unwanted effects of most of the drugs I’ve taken in the past. I have tried a huge range of ways to manage my migraine attacks, without significant improvement. To me, the potential side effects are worth the risk of trying these new medications. The downside is the emotional rollercoaster many of us will have. Feelings of hope and potential disappointment and frustration if we can’t get access to try these new medicines and see if they are effective for each of us. Do patients have trouble getting insurance coverage for treatment? Do costs affect patients’ choice of treatment, or their ability to access treatment? I have had to appeal multiple insurance denials for treatment to try certain options. The biggest access issues I’ve had has been related to Botox and ketamine infusions. Both were both denied multiple times when first prescribed by my doctor. Even after years of demonstrating that these treatments are helpful for me, I still get denied coverage by insurance companies who had previously approved these treatments. I am forced to start all over and appeal their decision, often citing their own previous approvals. The appeal process can take months to reach a resolution, causing me increased pain and lower productivity as I am forced to withdrawal from a medication. I’ve been prescribed a medication and had an insurance company make me prove that I have exhausted other treatment options. I’ve gone to the pharmacy to pick up a prescription, only to find out that the insurance company deemed a cheaper medication to be best for me. A decision that should be between my doctor and me. Having medical insurance is key to keeping the continuity of care. Denials, pre-authorizations, step therapy and non-medical switching create gaps in access to medicines that keep my life as stable as it can be. Forcing me to jump through these hoops actually costs the insurance companies more in the long run. I am more likely to visit the emergency room multiple times, go to the doctor more often and get prescribed new medications that only mask the pain for a little while. Having an affordable plan that covers my medications is crucial. I pay $427 a month to have an insurance plan that will allow me to see the best specialists, cover a large portion of medication costs, and to have a low deductible. I average two 5-day in-patient hospitalizations per year. I require roughly 3-5 emergency room visits a year when the cycle of migraine attacks cannot be broken. I probably have 2-3 doctor visits per month relating to my migraine disease and associated co-morbidities. In 2016, my medical expenses totaled approximately $100,000. Of that, I paid $16,000 out of pocket for insurance premiums, medication co-pays, doctor visits, hospitalization and emergency room visits. That’s over $1,300 a month. My Social Security disability income is all but eaten up in paying for these expenses. Does it make sense for insurance to pay $100,000 per year for the next 30-40 years to manage my chronic migraine? It makes more sense for insurance companies to responsibly cover and provide access to new preventative medications that could reduce my need to take 15 pills a day and maybe keep me out of the emergency room or hospital. I shouldn’t have to physically suffer when a CGRP drug could improve my functionality enough to return to work. Please share any other information that you think is important for us to know from a patient perspective. Migraine doesn’t discriminate. It takes and it takes. It’s not a headache. It’s an attack. It’s not a female issue, it’s a disease. One in five Americans will experience a migraine attack this year. Four million of us have chronic migraine. The economy will lose $31 billion in revenue due to lost productivity. When is it our turn to become a priority? I work hard to find any opportunity to educate, commiserate and celebrate with fellow migraine patients. I humbly ask that you make our community a priority. Improving our quality of life must be valued. I am the founder of GoldenGraine.com, a writer for Migraine.com, INvisible Project, contributor to the Headache and Migraine Policy Forum, Healthy Women, Healthline and have been published on The Mighty.com, XOJane, Medium, American Massage Therapy Association. I am the Migraine Advocacy Liason for U.S. Pain Foundation, on the steering committee for CHAMP, member of the Headache and Migraine Policy Forum, recipient of the Impact Award 2017 for the Association of Migraine Disorders, active in the Alliance for Headache Disorders Advocacy’s annual event, Headache on the Hill. ← Can We Talk About Health Care For a Minute?